We’ve added a quick and easy tutorial on how to make a girls tutu for a birthday party or any event to the Birthday Party Ideas 4 Kids website. This is a free step – by – step guide on how to make a no sew tutu for your little girl. All you need is ribbon and tulle – it’s that easy!! Can be made for any age or size – even adult! Makes up in just a few hours. 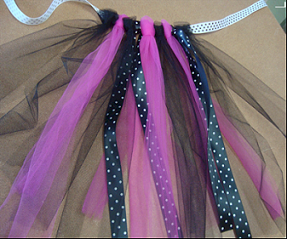 Great for costumes or party favors for ballerina, fairy or princess parties.